There has been speedy growth in mining, construction, and the energy sectors such as power and oil and gas owing to the growing demand for fuel sources, metals, and housing and infrastructure requirements across geographies, especially in China and developing countries in the SEA & rest of Asia Pacific. This has been deciphering into higher demand for mining, power and oil and gas equipment as well as devices used in steel, cement, glass, pulp and paper and the construction industries. This, in turn, has been causing a rise in the demand for chromium carbide overlay plates and other products which improve the equipment life and efficiency, thereby reducing maintenance costs and downtime of the equipment. 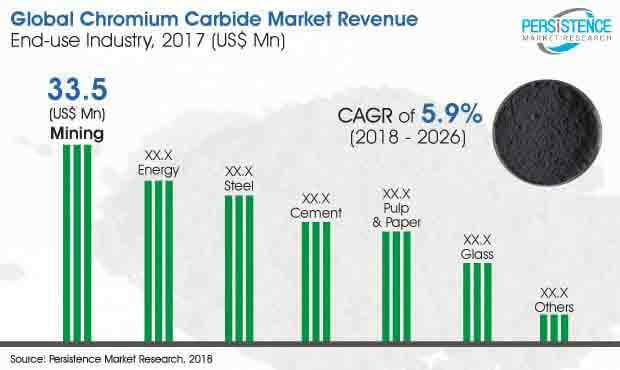 Thereby, the mounting size of these core industry sectors has been proving to be instrumental to the growth of the chromium carbide market. Some important applications of overlay products include fan blades, shovel buckets, dragline buckets, hopper liners, dozer skins, loader buckets, housing liners, and spiral conveyors. The consumption in the mining industry comprises the employment of chromium carbide in chromium carbide overlay plates used in truck beds, dragline buckets, dozer blades, shovel buckets and excavator liners, and hoppers. Furthermore, cutting tools employing chromium carbide and tubular hard-facing electrodes with chromium carbide compositions are extensively used in the mining of coal, aluminum, minerals, and zinc ore. There has been rapid growth in mining, construction and the energy sectors such as oil and gas and power owing to surging demand for metals, fuel sources and housing and infrastructure requirements across geographies, especially in developing regions such as China and the SEA and the rest of APAC countries. This has been converting into advanced demand for mining, power and oil & gas equipment as well as equipment used in steel, cement, glass, pulp and paper and the construction industries. This, in turn, has been resulting in an increased demand for chromium carbide overlay plates and other products which enhance equipment life and efficiency, thereby reducing maintenance costs and downtime of the equipment. Henceforward, the mounting size of these major industry sectors has been proving to be instrumental to the growth of the chromium carbide market. Some important applications of overlay products include fan blades, shovel buckets, dragline buckets, hopper liners, loader buckets, housing liners, dozer skins, and spiral conveyors. China is expected to remain on the vanguard in the consumption of both steel as well as chromium carbide, in the steel sector. The rapid development of the infrastructure and major industrial activities in the mining, energy, steel, and cement sectors in the country is anticipated to fuel demand for specific industrial equipment requiring chromium carbide as the raw material, and thereby drive chromium carbide market growth. The production of chromium carbide overlay plates used in steel industry applications such as those in coke vibrating screen plates, fan blade, apart from cutting tool, blast furnace liners, machining tool and welding electrodes are the key end uses of chromium carbide in the steel industry.